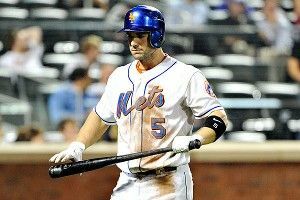 Should the Mets trade David Wright? but for the right price, it could make lots of sense for the Mets. Given the massive boost the Yankees would get by sending Ibanez to Irkutsk and nudging A-Rod to DH, it certainly would make sense on their end. That’s one possible destination. But there are multiple other teams that might have the means and the will to make a Wright deal at the deadline (Angels? Dodgers under new ownership, if they can sign Wright to an extension?). Alderson has a chance to goose the rebuilding process by cashing in his most marketable assets for promising prospects. If he can handle the inevitable New York tabloid backlash, it could be an endeavor worth pursuing, starting with Wright. If the Mets get that kind of production from Davis and Duda over a whole season, this becomes a more interesting team. Davis appears over his case of Valley Fever, so there’s at least some hope of translating something close to last year’s big numbers (.391 wOBA) over 150-plus games. There’s a hint of power upside here for Davis and the rest of the team, after the Mets finally caved and moved in the fences at Citi Field. The bigger problem is the Mets’ horrendous defense: They finished last in baseball last year in UZR. Ruben Tejada has the monumental task of replacing Jose Reyes at short; there’s at least a germ of hope that he can provide some decent on-base skills and defense as he takes over the starting job at age 22. The Mets will eventually try to work other young players into the lineup, with left and center field as two of the positions most in need of long-term solutions. holy Johan Santana! Yes, Santana posted a 3.54 FIP two years ago while tossing 199 innings. But his strikeout rate continued its nosedive that year, followed by Santana suffering a torn anterior capsule in his pitching shoulder that September, knocking him out for most of the 2011 season. If by some miracle Santana were to come back and pitch an entire season at near All-Star level, you’d think Alderson would shop the hell out of him, what with $55 million owed to him over the next two-plus years (including his 2014 option). Niese is the breakout waiting to happen here, after posting a strikeout-to-walk rate above 3-to-1 last year over 26 starts, with a 3.36 FIP more than a run lower than his ERA. R.A. Dickey is wildly underrated on the field, even more so off it. The Mets got some grief for giving Frank Francisco a two-year deal, but his peripherals (better than a strikeout per inning) and a move to the National League bode well for solid results. This team might give up too many runs this season anyway, but that would likely be the defense’s fault more than that of the pitchers. Duda. First full season as a starter plus closer fences plus solid power (27 homers across three levels in 2010) plus solid minor league walk rates bode well for a strong age-26 season. Merely avoiding last place would be a coup, given the Mets’ lack of talent and the possibility of four over-.500 (or better) teams duking it out for playoff spots. Ultimately, finding suitable trade partners for the team’s high-priced talent would be a bigger coup than eking out a few more wins this season. Santana gets hurt again, Davis and Duda don’t develop, Bay doesn’t do enough to draw trade interest, and the Wilpons invest whatever money they have left in the only venture riskier than Bernie Madoff.